Americans in the 1950s found new ways of enjoying themselves, from the rapid proliferation of television sets into every home, to the dawn of a new age of popular music, rock and roll, symbolized by a charismatic crooner named Elvis Presley. Baseball’s place in American culture was still paramount, though the competition was gaining. In Boston, the baseball landscape changed dramatically in 1953 when the Braves moved to Milwaukee. Despite having the city to themselves, the Red Sox steadily lost attendance throughout the decade, due mainly to a series of teams that failed to contend. But because of television, fans of the region were able to “watch” Red Sox baseball for the first time without setting foot in Fenway Park. With its lagging fortunes of the team on the field, the club retained its hold on the hearts of the region throughout this period. The 1950s Red Sox were teeming with huge stories. You might know about Ted Williams, of course, but consider his teammates: Harry Agganis, a legendary local athlete whose tragic death is remembered by millions in the region; or Jimmy Piersall, whose illness and breakdown led to a book and two movies; or Jackie Jensen, a famous collegiate football star who forged a great career with the Red Sox. The Red Sox are famous for failing to integrate until 1959, the last team to do so. Depicted here are the people mostly blamed for this oversight (Tom Yawkey, Joe Cronin, and Mike Higgins), as well as the man who finally broke the color line (Pumpsie Green). Thanks to the Society for American Baseball Research (SABR), you can read the stories of 46 of these men, including all of of the aforementioned and one of the greatest announcers ever, Curt Gowdy. But along with many of the people you might remember, there are still plenty of lesser-known players that you can discover for the first time. All of these men made it the major leagues and played well enough to stick around for at least a few years. We think all of them are worth learning about, and hope you enjoy doing so. E-book: Click here to download your FREE e-book copy of Red Sox Baseball in the Days of Ike and Elvis from the SABR Store. Available in PDF, MOBI/Kindle and EPUB formats. Paperback: Get the paperback edition of Red Sox Baseball in the Days of Ike and Elvis from the SABR Store ($15.99 includes shipping/tax). 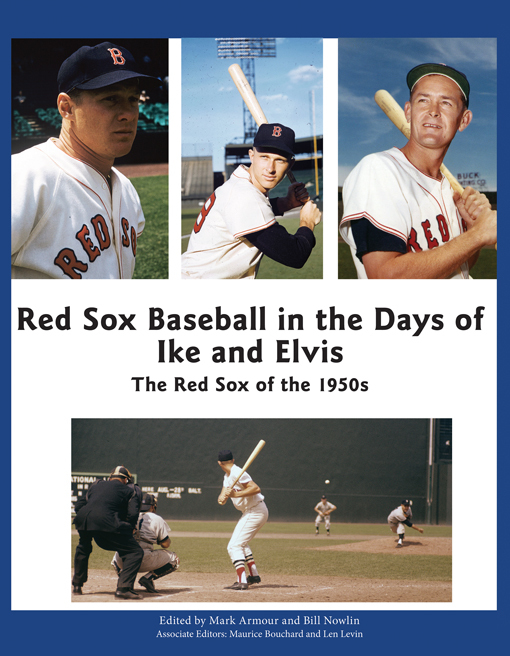 E-book: Click here to purchase the e-book edition of Red Sox Baseball in the Days of Ike and Elvis for $9.99 from the SABR Store. Available in PDF, MOBI/Kindle and EPUB formats. Paperback: Get the paperback edition of Red Sox Baseball in the Days of Ike and Elvis from the SABR Store ($30.99 includes shipping/tax). For 40 years, SABR and its members have led the way in publishing the best baseball historical and statistical research. Our publications program is shifting to take advantage of new methods of publishing. Not only will we continue to publish new books like CAN HE PLAY? A Look At Baseball Scouts and Their Profession (released in December 2011) and OPENING FENWAY PARK IN STYLE: The 1912 World Champion Red Sox (released in May 2012), which showcase the best efforts of SABR's members, chapters and committees, but new technology makes it possible for us to bring out-of-print titles like RUN, RABBIT, RUN: The Hilarious and Mostly True Tales of Rabbit Maranville (released in February 2012), GREAT HITTING PITCHERS (released in March 2012), and NINETEENTH CENTURY STARS (released in August 2012) back again. Books will be available in digital formats as well as paperbacks produced by "print on demand" (POD). This page was last updated October 31, 2017 at 10:07 pm MST.